Ready to finally conquer your to-do list and propel your business toward your goals? I have to admit my bulletin board was recently one giant sticky note. I didn’t know where to begin or why I never seemed able to finish those silly little lists. Thankfully, with a little help from this book, I’m now crossing off my lists and moving forward with my business! I am one of those people who set huge goals and start on them guns blazing. Then two days later, my guns are stone cold. I truly believe Laura’s book offers insight into how to kick that habit and actually get those big projects off your to-do list. She created, in her own words, “a system for creative small business owners that acts as a template for action.” The e-book offers a means to really look at what is holding you back, what things you can ask for help on, and what your biggest distractions are. Once you honestly write those issues down, you’ll get a much better sense of how to battle those obstacles and meet your goals. What makes Laura’s book unique? Laura knew that the solution to my sticky note problem would be unique to me and thus her entire book is a series of worksheets! The plans and tricks she offers are all perfectly suited for my unique business, work schedule, and obligations because I shape them to fit my needs. That’s why it works so well! Planners! After all the brainstorming and problem-solving you get to do, Laura leaves you with 13 planners. Everything from daily tasks and yearly overviews to a project planner and the universe’s to-do list (a place where you get to ask the universe for help). I finished her book feeling more motivated than ever to start acting on my dreams and clear off my bulletin board. 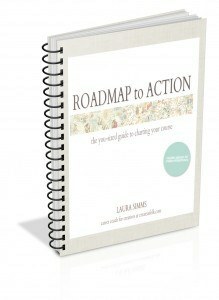 If you’re finally ready to get real about the distractions and obligations holding you back, you are going to love Laura’s e-book, Roadmap to Action. She helped me discover my prime working time and taught me how to prioritize my to-do items. I now set aside 10 minutes every day to do 2 of my short and sweet items (that I would otherwise easily set off for weeks). I’m already tossing out crossed-off lists and I can’t wait to start fresh in the next week with a clean slate.